$25 for an 8 foot table and two chairs. You can also choose to upgrade to have a table with electricity for $5 more – we only have 6 electric spots left out a total of 10. If you prefer to sign up and pay in person, call Andrea at 540-588-9760 to reserve your table. On May 5th, the lodge was pleased to host the 4th Annual Jesse Carper Memorial Benefit! Approximately 150 folks showed up to lend their support. Whether it was for the Muskie fishing tournament, enjoying the great bluegrass music provided by 3 local bands, participating in the raffles, or all of the above, a good time was had by all. By the end of the day, over $3,000.00 had been raised for the “Hooked on Fishing” program in Craig County. Many thanks to the organizers who worked hard to make this event happen. Many thanks to the awesome lodge team that made the day flow. Many thanks to the bands, The Comptons, Mason Cove, and our own Blue Connection, who donated their time and talent for this worthy cause. Roanoke Moose Family Center 284 was pleased to host our first responders as they used our facility for their command center when they battled a wild brush fire on Catawba Mountain. Many thanks to Virginia and US Forestry and the many firefighters who evacuated the hikers and put out the fire on Catawba Mountain. Also, many thanks to the EMTs who were on hand to help the firefighters maintain their health as they battled the flames. 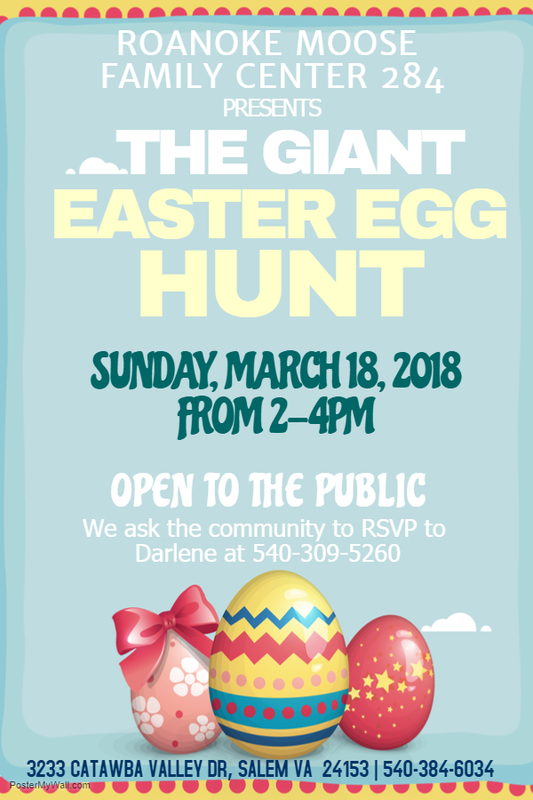 We invite the community to join us for our annual Easter Egg Hunt at Roanoke Moose Lodge 284. Hop on over for a bunny of a good time! Free event and Open to the Public – all welcome. Due to the enormous response we had last year, we are asking everyone to RSVP to Darlene at 540-309-5260 by March 10th so we can ensure we have enough supplies for everyone. 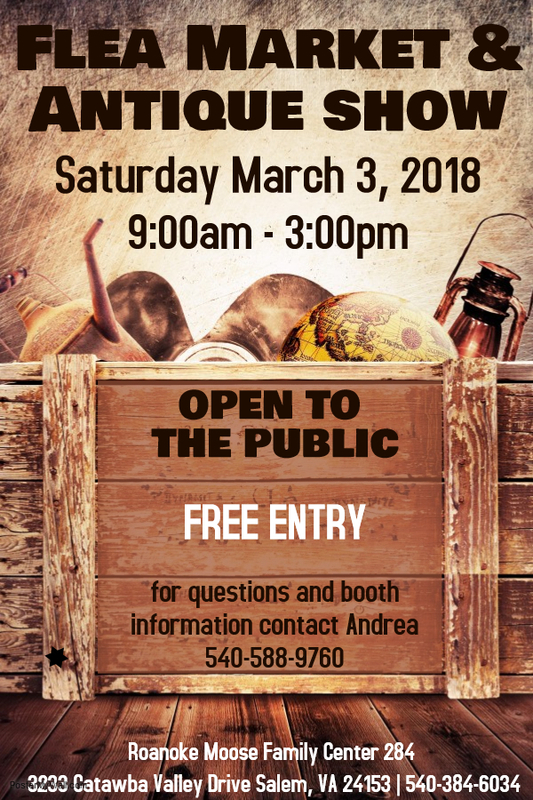 On Saturday, March 3 we are proud to host an INDOOR Spring Flea Market and Antique Show. Here’s your chance to pick up some new treasures while we get ready for spring. OPEN TO THE PUBLIC! Call Andrea at 540-588-9760 to reserve your table. $20 for a 10×10 space including an 8 foot table and two chairs.